My mom just bought a new trailer for our annual family camping trips. For Christmas I thought it would be nice to make a decoration for it. 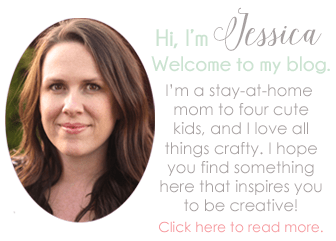 She is the one who taught me how to craft and sew after all. 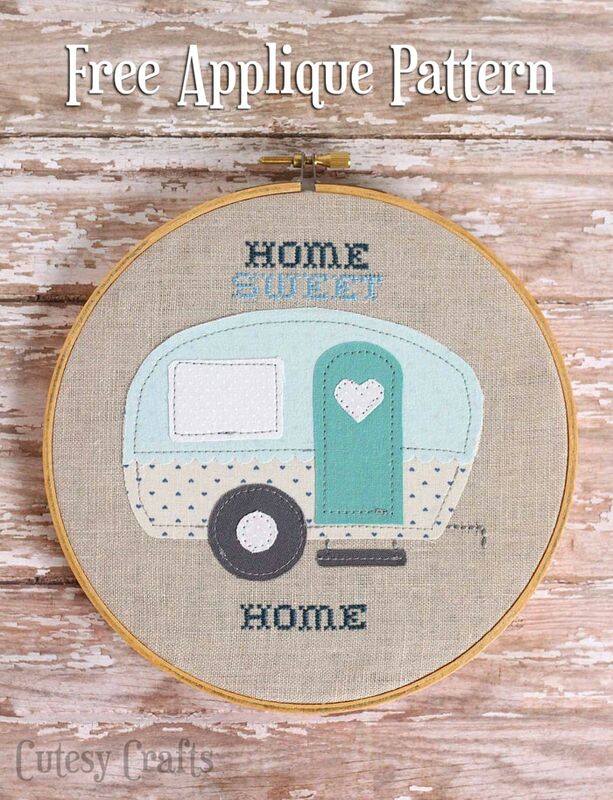 I came up with this sweet applique design for a vintage trailer and cross stitched the words “Home Sweet Home” around it. 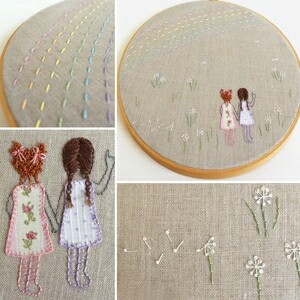 You know how much I love hand embroidery! I think she really loved it! I also gave her a framed collage with photos of me and my siblings growing up camping. 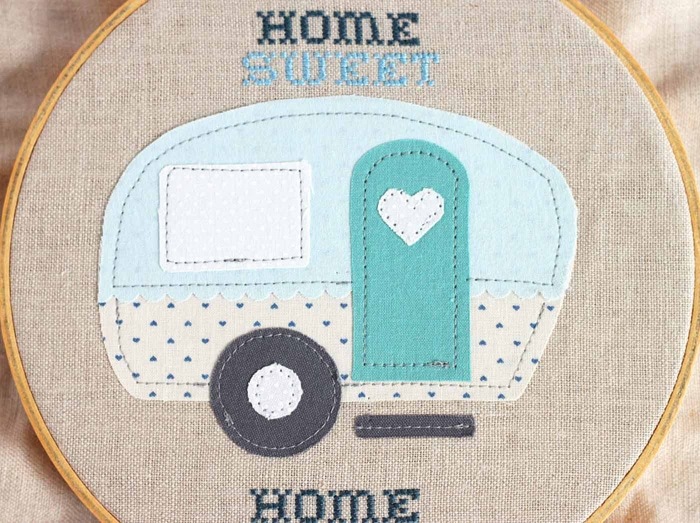 First, you’ll want to cross-stitch all of the words. 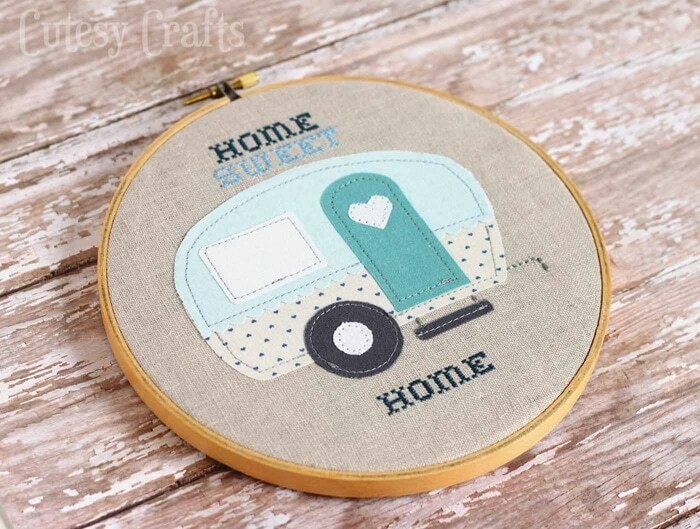 If you’ve never cross-stitched on linen, I suggest searching for some tutorials. It’s a little bit tricky at first, and you want to make sure you have good lighting. 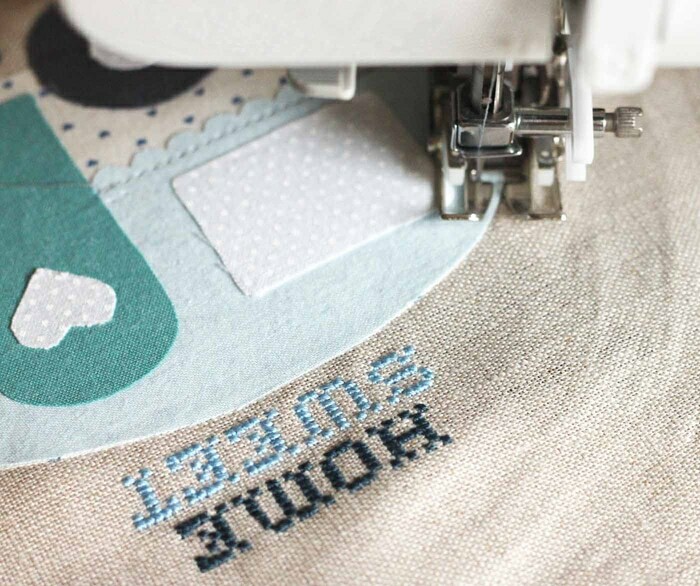 If you have poor eyesight or you’ve never cross-stitched before, you might try using some Aida cloth instead. Cut out the paper trailer from the pattern to use as a guide for how far to space the last word. The first and last words are the same, so that makes it easier to line up. 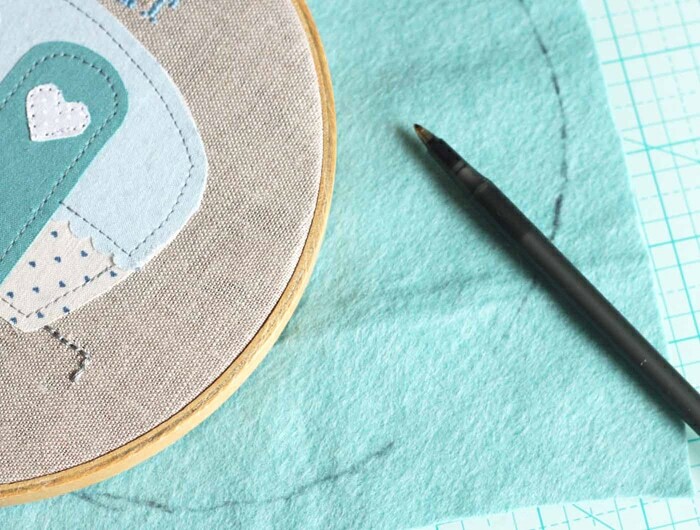 For the applique pieces, first trace the pattern on the paper side of your interfacing. 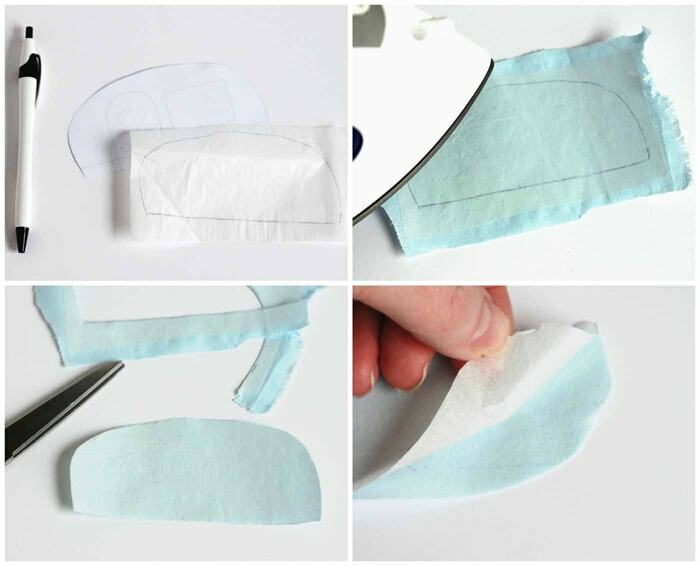 Put the interfacing, paper side up, onto the back of your fabric, and press with a hot, dry iron. 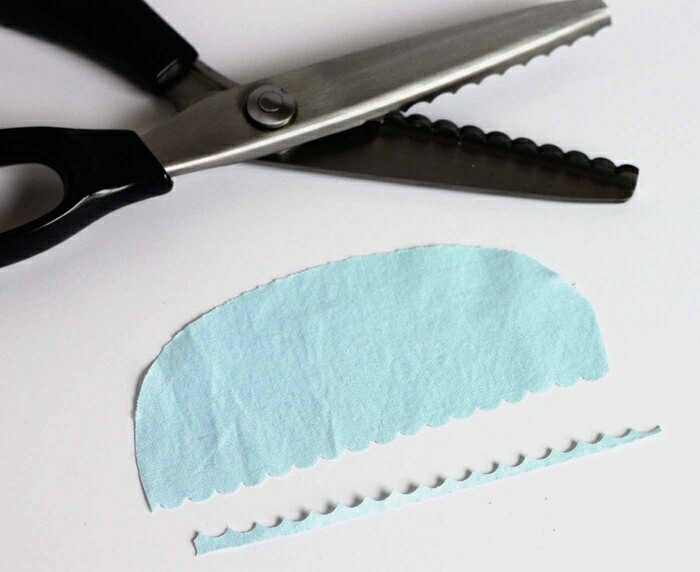 Cut out the pattern and peel off the paper backing. 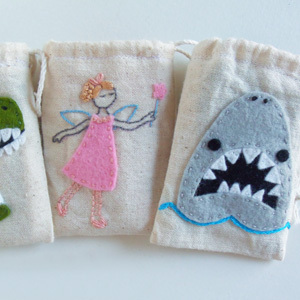 Do this with all of the pattern pieces. 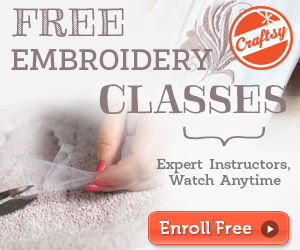 To see my “How to Applique By Hand” video, go here. Use some scallop shears to cut the bottom of the “trailer top” piece. Surprisingly it was hard to find fabric scallop shears. I ended up buying these off of Amazon. Doing this is optional, so don’t feel like you have to. 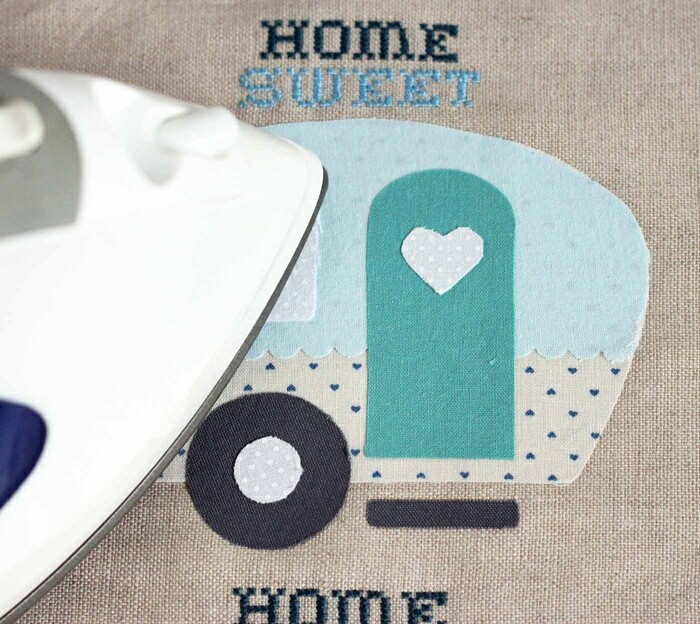 Iron all of the pieces onto your linen, layering them one by one. 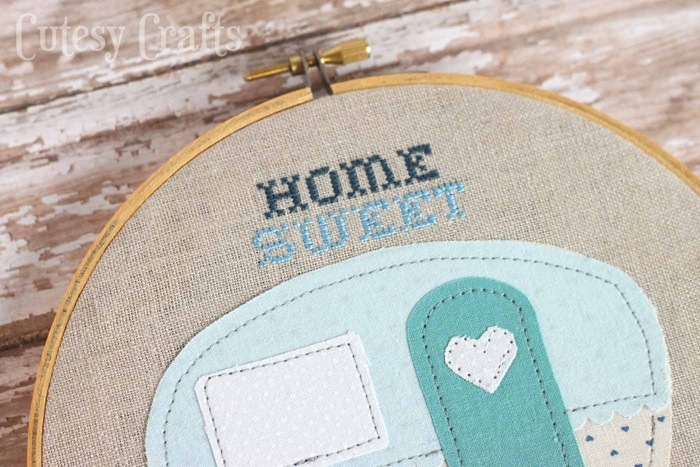 Use gray thread to machine stitch around the outside of all of the pieces. 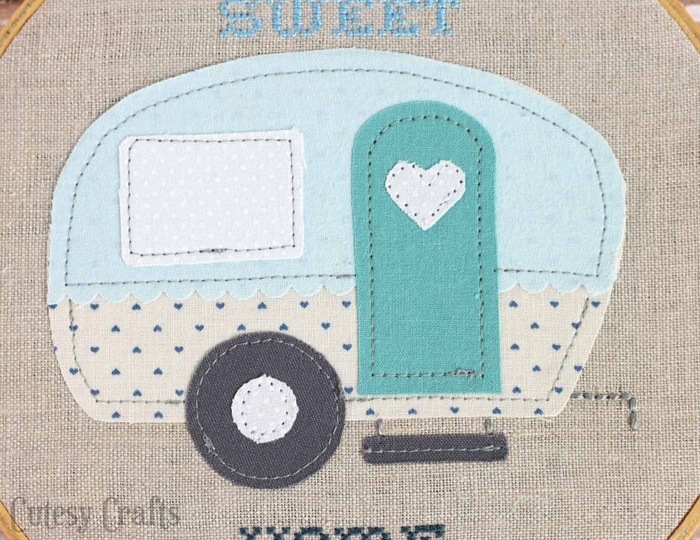 You can also hand stitch if you want, but I liked the look of machine stitching for this. It’s hard to get a smooth line on the heart and inside of the wheel because the pieces are so small. I used white thread for those parts to match the fabric, so the stitches don’t show as much. 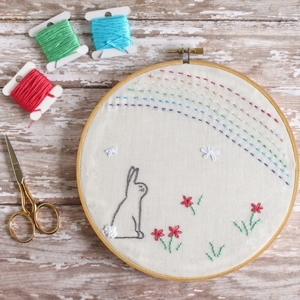 Use a full strand of embroidery floss and stitch the step and hitch details. 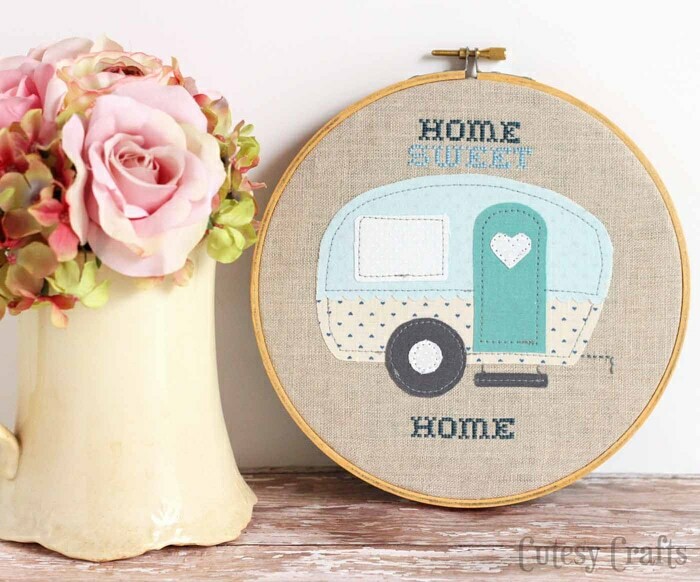 There are different ways to finish off the back of embroidery hoop art. For my hoop, first I cut off some of the excess linen fabric, leaving a couple of inches. 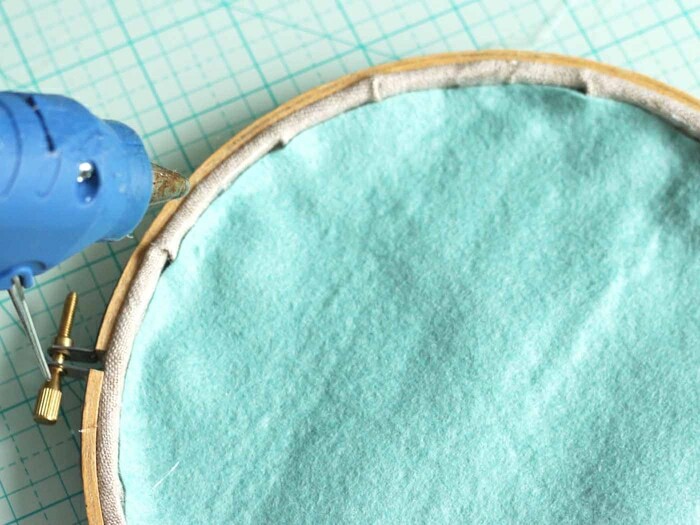 Fold over the fabric and hot glue it to the inside of the hoop on the back. 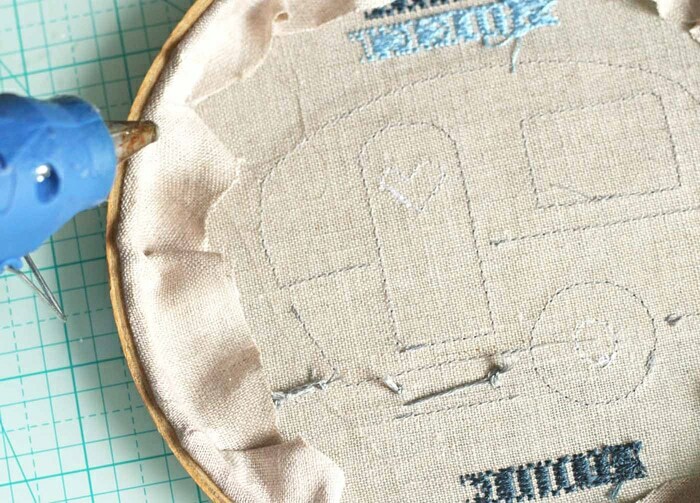 Keep the glue on the hoop so it doesn’t seep through to the front of the design. 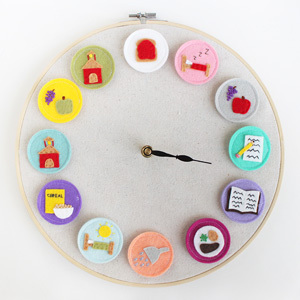 Trace a circle of felt the same size as your hoop and cut it out. Glue the felt to the inside of the hoop to cover up the raw edges of the linen. There you go! 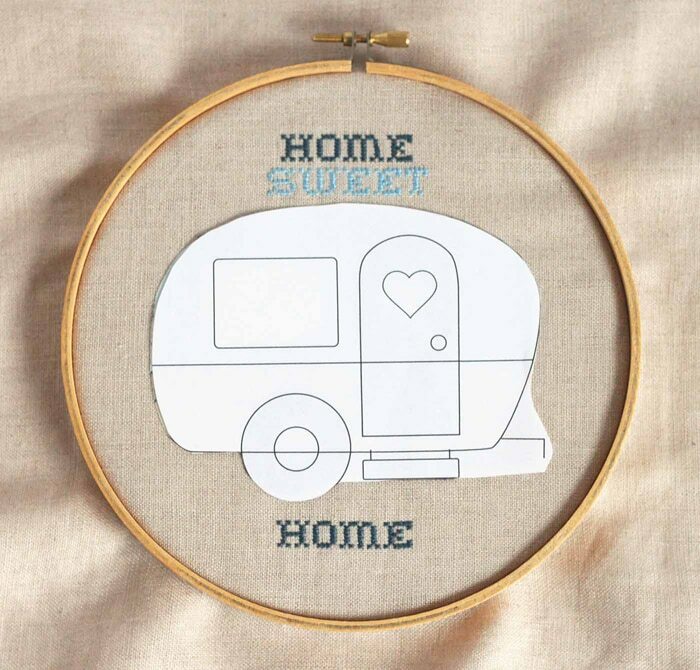 This would make such a great gift for someone who loves to travel in their trailer. You’re welcome! I’m so glad you like it! Beautiful! Your mom must just love it! Thanks Heather! I think she likes it a lot.